A minimum of five dollars can get someone's task completed! How is that possible? It can happen on a micro jobs website. Online micro jobs or small tasks are those that are done by employees interested in working from their homes and who want to make some extra money. These jobs, ranging from logo design, content writing, video making, resume building, etc can be offered by businesses or individuals who want such tasks completed. This growing sector in the financial world is known as Gig economy, which is seeing a steady rise. Riding high on the success of micro jobs websites like Fiverr, aspiring entrepreneurs have now set their eyes on this rapidly growing micro jobs industry. Succeeding as an entrepreneur running a micro jobs website isn't very difficult, provided you are on a right track. While many are the factors that play a role in your success, the first hurdle lies in creating a website. Choosing a right script for powering your website is important. Ready-made scripts come with a host of advantages. In the context of micro jobs, Fiverr clone script would be a practical choice. Coding, designing and testing would be intimidating for many aspiring webmasters. Moreover, it would be full of hassles. With a ready-made micro jobs script, there would be no such worries. Opting for a ready-made script also means you will not compromise on the quality of your website as well. 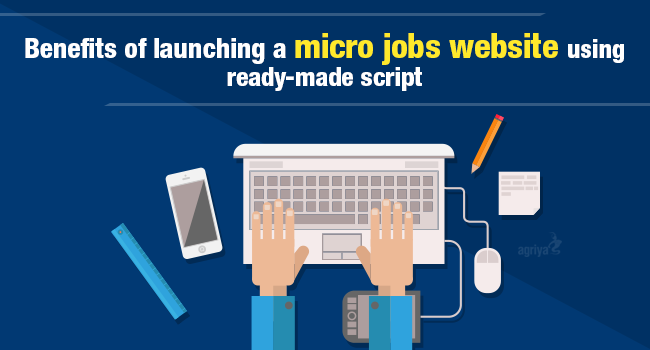 As the ready-made micro jobs script is developed based on the existing, successful websites, there will be a sense of confidence to enter the online market. Because the business model is tested and has proven track record of bringing great revenues to entrepreneurs who launch a micro jobs website. Ready-made micro jobs script has marketing strategy inbuilt. The designs are SEO friendly, even the coding is done in such a way that the website reaches easily to the audience. In case an entrepreneur wants his website to cater to some specific Gig verticals, that is also possible with the use of ready-made script. They can adapt the script to any niche. Another beauty about the ready-made script is that they can be customized. Entrepreneurs can seek customization, get the required changes done to the script and only then use the script to launch a micro jobs portal. The script also comes with an exclusive payment mechanism. Entrepreneurs can go for a combination of both national as well as multinational payment gateways. This way, the payment gateways they offer to their users will be abundant. Success will be assured for entrepreneurs who choose a high-quality micro jobs script, however, all this can come only with proper planning and marketing. If done diligently, huge revenues will be assured.